Area firefighters attended a training hosted by Woodstock Fire Resuce at a water booster station near Centegra Hospital Wednesday, July 18, 2012 in Woodstock. Mike Greene - mgreene@shawmedia.com Ross Chapman (left), of the Long Grove Fire Department, and Bill Hoover, of the Wauconda and Nunda Rural Fire Departments, stabilize a simulated victim during a confined space training hosted by Woodstock Fire Resuce at a water booster station near Centegra Hospital Wednesday, July 18, 2012 in Woodstock. 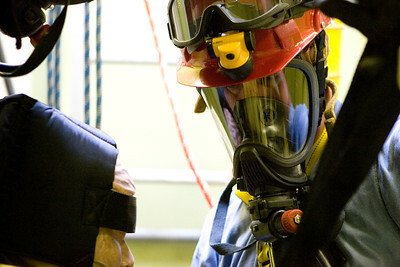 Mike Greene - mgreene@shawmedia.com Ross Chapman, of the Long Grove Fire Department, checks his gear before entering a water booster station near Centegra Hospital during a confined space training hosted by Woodstock Fire Resuce Wednesday, July 18, 2012 in Woodstock. 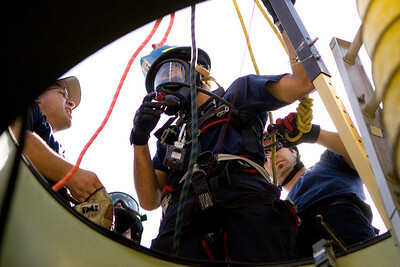 The event, which drew participants from five stations and two MABAS divisions, simulated a confined space rescue in an area no bigger than a bedroom. 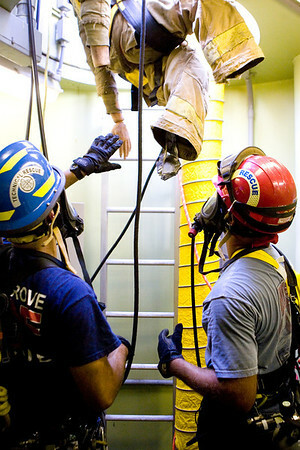 Mike Greene - mgreene@shawmedia.com Ross Chapman, of the Long Grove Fire Department, prepares to be lowered into a water booster station near Centegra Hospital during a confined space training hosted by Woodstock Fire Resuce at a Wednesday, July 18, 2012 in Woodstock. 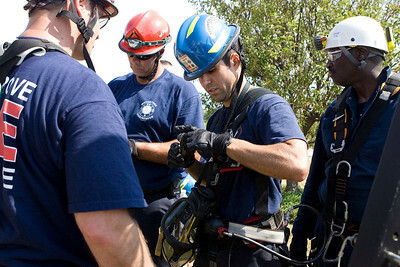 The event, which drew participants from five stations and two MABAS divisions, simulated a confined space rescue in an area no bigger than a bedroom. 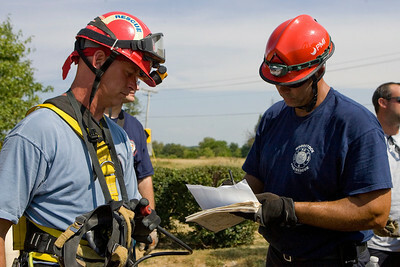 Mike Greene - mgreene@shawmedia.com Bill Hoover (left), of the Wauconda and Nunda Rural Fire Departments, checks in with Woodstock Fire Department TRT Team Leader DeAngelo Cooke during a confined space training hosted by Woodstock Fire Resuce at a water booster station near Centegra Hospital Wednesday, July 18, 2012 in Woodstock. 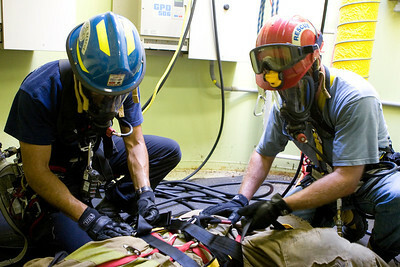 Mike Greene - mgreene@shawmedia.com Brenden Parker, of the Woodstock Fire Department, looks down into a water booster station near Centegra Hospital during a confined space training hosted by Woodstock Fire Resuce at Wednesday, July 18, 2012 in Woodstock. The event, which drew participants from five stations and two MABAS divisions, simulated a confined space rescue in an area no bigger than a bedroom. Mike Greene - mgreene@shawmedia.com Bill Hoover, of the Wauconda and Nunda Rural Fire Departments, keeps a watchful eye on a simulated victim during a confined space training hosted by Woodstock Fire Resuce at a water booster station near Centegra Hospital Wednesday, July 18, 2012 in Woodstock. The event, which drew participants from five stations and two MABAS divisions, simulated a confined space rescue in an area no bigger than a bedroom. Mike Greene - mgreene@shawmedia.com Woodstock Fire Department TRT Team Leader DeAngelo Cooke speaks with the group following a confined space training hosted by Woodstock Fire Resuce at a water booster station near Centegra Hospital Wednesday, July 18, 2012 in Woodstock. The event, which drew participants from five stations and two MABAS divisions, simulated a confined space rescue in an area no bigger than a bedroom. Mike Greene - mgreene@shawmedia.com Ross Chapman (left), of the Long Grove Fire Department, and Bill Hoover, of the Wauconda and Nunda Rural Fire Departments, watch as a simulated victim is hoisted up during a confined space training hosted by Woodstock Fire Resuce at a water booster station near Centegra Hospital Wednesday, July 18, 2012 in Woodstock. Mike Greene - mgreene@shawmedia.com Jason Henriksen, of the Lake Zurich Fire Department, loads a MABAS vehicle following a confined space training hosted by Woodstock Fire Resuce at a water booster station near Centegra Hospital Wednesday, July 18, 2012 in Woodstock. The event, which drew participants from five stations and two MABAS divisions, simulated a confined space rescue in an area no bigger than a bedroom. 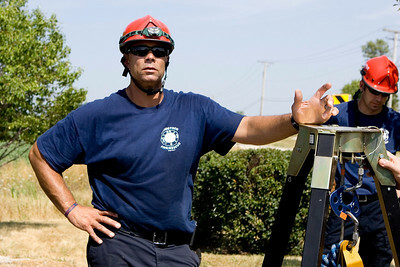 Bill Hoover, of the Wauconda and Nunda Rural Fire Departments, keeps a watchful eye on a simulated victim during a confined space training hosted by Woodstock Fire Resuce at a water booster station near Centegra Hospital Wednesday, July 18, 2012 in Woodstock. The event, which drew participants from five stations and two MABAS divisions, simulated a confined space rescue in an area no bigger than a bedroom.